Trailer Side Kicks are helpful both for parking your vehicle within your trailer and for changing a trailer tire. 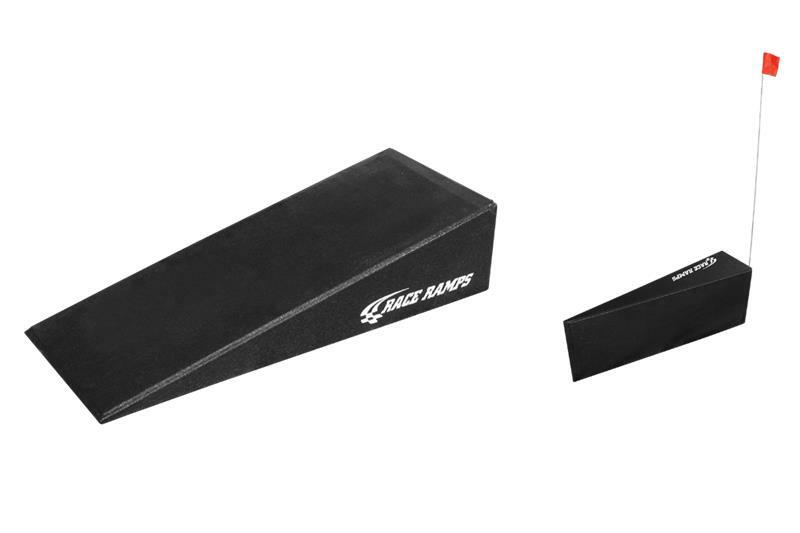 Side Kicks fit in front of a trailer’s wheel wells to provide a tapered, protective guide between your vehicle’s wheels and the trailer’s steel wheel wells. Tall marker flags indicate their placement and help guide you onto the trailer without any scrapes or scratches. In addition, Trailer Side Kicks can be used as ramps for changing a trailer tire: Simply drive the good tire onto the ramp and the flat tire will be lifted off of the ground for easy removal and replacement. They can be used on any level surface—pavement, grass, or even sand—without sinking. Side Kicks provide 7.5″ of lift with a 13 degree angle of approach and are 12″ wide and 31″ long. Weighing in at only 8 lbs. each, they can still hold up to 1,500 lbs. each, for a total weight capacity of 6,000 lbs. They are sold individually or as a set of two. Trailer Side Kicks are 100% solid, made with a high-density expanded polystyrene that is coated with a hybrid polyurea. This patented process results in a product that is extremely lightweight, yet strong and durable. They will not slide, scratch, or otherwise damage any floor type.